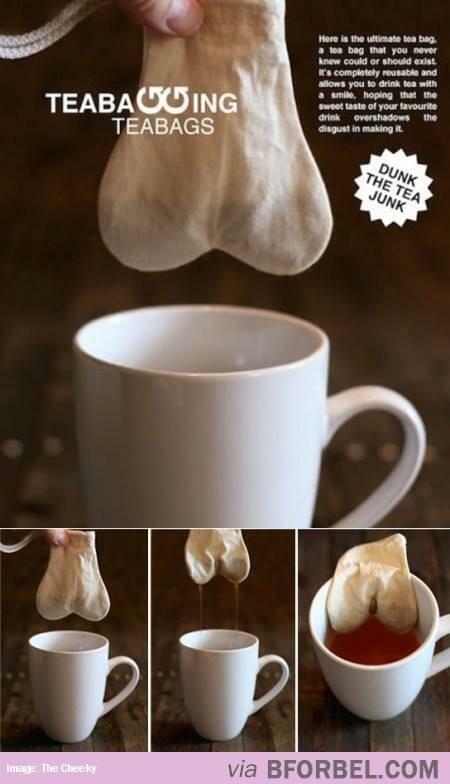 OMAHA, NE – Nowadays Conservatives, Republicans and even overly sensitive Progressive elite types will get offensive over the words TeaBag, Teabagger, and TeaBaggery, but lets get real! Get over it!!! The TeaBaggers picked the name!!! Remember those very public protests that came out against all those horrible taxes we all have to pay, and a group of whites wanted to TeaBag the new black President? Taxed Enough Already, that’s what they said. Let’s not forget the hats they wore with TeaBags a hanging, loose politics a dangling. Rachel Maddow covered much the Tea Party doing its TeaBagging thang in the early days of Obama’s presidency. Oh the Insani-TEA of it all! She had quite a laugh in some of her shows about it. The Humble Libertarian wanted YOU to TEABAG the Fools in DC. Listen TeaBaggers, quit your crying. You guys built this with your own ignorance!!! 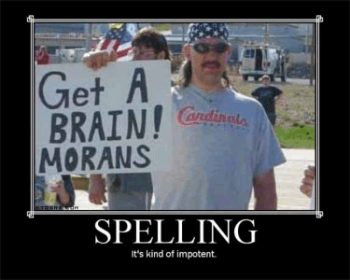 When your group made its existence known by wearing teabags on your stupid hats and teabags on your ignorant heads and carrying misspelled signs that said, “TeaBag the President before he TeaBags you!” or TeaBag the Democrats before they TeaBag you!” someone was bound to call you all “TEABAGGERS”. The Tea Party represents what got left behind in American schools. For example, these people think they are experts on what the LGBT community is about, but somehow they didn’t know gay guys like to “teabag” each other before they decided to put “TeaBag the President before he TeaBags you” on their signs in their earliest rallies! The perfect name for the perfect symbols of ignorance America has EVER had to offer!!! Reminder to TeaBag Fools in DC. Yes! 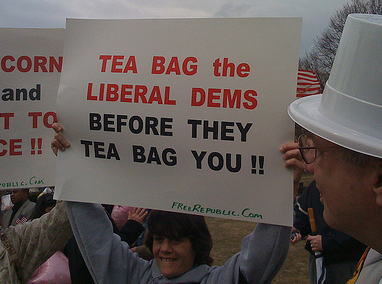 TeaBag the Liberals Before They TeaBag You!!! OMAHA, NE – The National Center for Lesbian Rights went on record against supporting ENDA a few weeks ago. It was joined Tuesday, July 8th, 2014 by the American Civil Liberties Union, the Transgender Law Center, Lambda Legal,Gay & Lesbian Advocates & Defenders and the National Gay and Lesbian Task Force Action Fund. The Equality Pledge Network officially launched last week to push for one-bill strategy for full federal equality, calling for Congress to “Add4Words” to existing statutes as a solution to LGBT inequality issues. The American Equality Bill would add Sexual Orientation and Gender Identity to existing laws like the Civil Rights Act of 1964, 1972 Education Amendment Act, Fair Housing Act and Fair Credit to name a few which would affect areas of Employment, Education, Public Accommodation, Public Facilities, Housing, Federally Funded Programs and Credit to name a few. ENDA only covers employment, and LGBT groups now balk at ENDA’s expansive religious exemptions, basically codifying discrimination for religious excuses. Time to move on to bigger and better ideas for full equality. “What has really shifted critically in the last year is a view among many people that efforts to misuse religious liberty to discriminate against LGBT people is not acceptable,” says Ian Thompson, a legislative representative in the ACLU’s Washington Legislative Office. LGBT groups have expressed their discomfort with the religious exemption clause at every step of the way. Now the ACLU and other groups are citing a few key developments in recent months that pushed them to change their positions. Examples, an attempt by Arizona lawmakers to pass a law that would have allowed people and businesses to discriminate in hiring and service practices on the basis of religion. The bill, known as SB 1062, was vetoed by Gov. Jan Brewer under extreme pressure not only from LGBT activists, but the business community and national politicians. Mississippi’s freedom to discriminate law went into affect July 1st. The straw that broke the camel’s back is quite possibly the recent SCOTUS Hobby Lobby decision. While some groups, including “Big Gay Inc” HRC still support ENDA, the recent announcement from dissenting LGBT groups is a huge blow to the struggling legislation and a big boost to supporting the idea of an all encompassing one bill strategy that would add four words to current statutes with existing protected classes. HRC did come out Wednesday voicing ultimate support for comprehensive full equality legislation. This situation has been a long time coming as grassroots activity has been growing in recent years to support a one-bill strategy that would add 4 words (sexual orientation gender identity) to existing statutes. ENDA only covers employment discrimination, but existing statutes cover more areas. Existing statutes like Civil Rights Act of 1964, Fair Housing Act, Fair Credit Act and 1972 Education Amendment Act cover areas of employment, public facilities, public accommodation, federally funded programs, education, housing and credit to name a few. A one bill strategy would identify and add to those existing protected classes in existing statutes these four words: sexual orientation gender identity. The best birthday present ever is handfuls of LGBT groups dumping ENDA on the same day . Time for better, broader and bigger pro-LGBT legislation folks!!! Don’t give these religious bigots an inch, (ie Hobby Lobby, Mississippi LGBT discrimination law) because they ARE taking the full mile!! OMAHA, NE – Earlier in 2014, the Unicameral voted down LB 943, a measure to raise Nebraska’s minimum wage to $9. The fight to raise the minimum wage in Nebraska has left legislature and is now in petition signature verifying mode. Over 130,000 signatures are now waiting to be validated by the Nebraska Secretary of State. The petition proposes a vote on raising the state’s minimum wage from $7.25 to $8 January 1, 2015 and $9 on January 1, 2016. The legislative attempt to raise the wage, LB943 failed on a 20-20 vote, and not one opponent stood up to speak on why they opposed it. “I’m disappointed, and I think the biggest thing that I’m disappointed in is that no one who was an opponent to the bill stood up and said why they’re opposed,” said Sen. Jeremy Nordquist of Omaha, the bill’s lead sponsor. Like many Americans, many Nebraskans are working hard and not making enough to make ends meet. While average CEO pay in Nebraska ranks it 5th in the nation, the average worker pay only puts Nebraska in 40th place. Nebraska has the 2nd largest pay gap in the nation, behind only Michigan. There is no excuse for this pay gap. While conservatives claim raises the minimum wage will lead to higher prices, they don’t make similar claims when executives receive million dollar bumps in their pay. A fact I find that only discredits their “minimum wage increase leads to higher prices” claim. If you work full time in America on a minimum wage, you should not be struggling. The following two charts were created from info found at this link: http://www.aflcio.org/Corporate-Watch/Paywatch-2014/CEO-Pay-by-State In the chart immediately below, you can clearly see Nebraska ranks #5 in average CEO pay. Top 10 States Average CEO Pay. In this next chart immediately below, you can clearly see Nebraska ranks #40 in average worker pay. Bottom 10 States Average Worker Pay. I’d love to hear what Pete Ricketts wants his Big Government Handouts for. I wonder what TD Ameritrade’s shareholder payout is like these days. 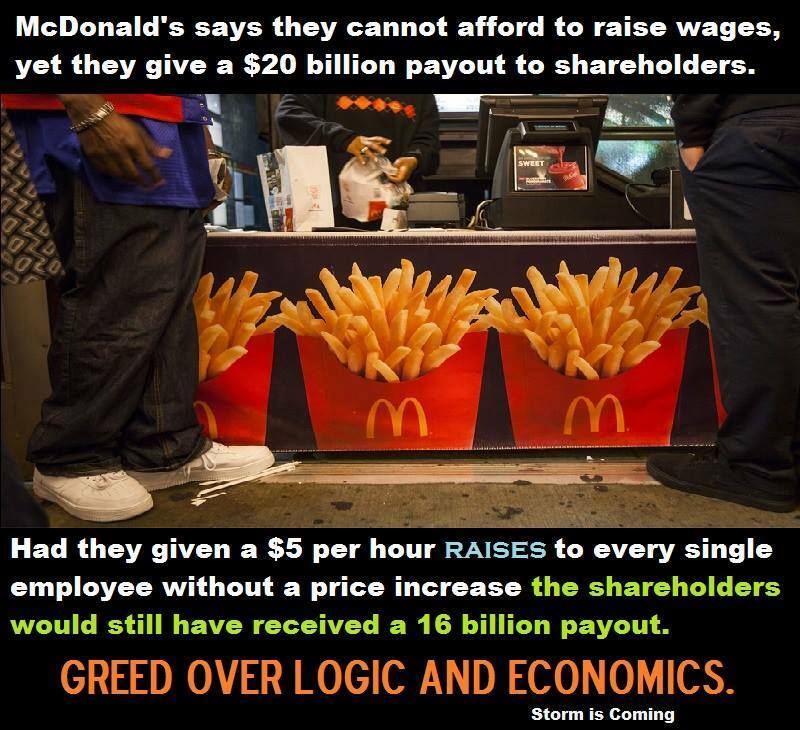 McDonald’s Gives Raises to ShareHolders, but can’t do same for Workers? Elizabeth Warren in the video below wonders why Minimum Wage isn’t at $22 like it should be if it kept up with production. One of the panel members points out it could be at $33 if it kept up with executive pay. Many opponents of a minimum wage increase argue it will raise prices, hurt jobs and hurt the economy overall. I do not see any credibility in those claims, because no one complains executive pay increases and $20 billion payouts to shareholders will raise those same prices. What people need to realize is that labor is why any corporation has any capital at all. It is long overdue for corporations to think better of the very people who make the filthy rich, filthy rich. A FaceBook page was created that is dedicated to demanding an apology from Norfolk’s Odd Fellows Lodge. The Page currently has over 260 FB likes in just 24 hours. The page will be a hotbed of activity for folks upset over the parade float. To the Odd Fellows Lodge and your allies, I must ask, what’s next, a parade where the participants wear white robes and hoods? A racial lynch mob? Public Stoning of Queers along the Parade route? 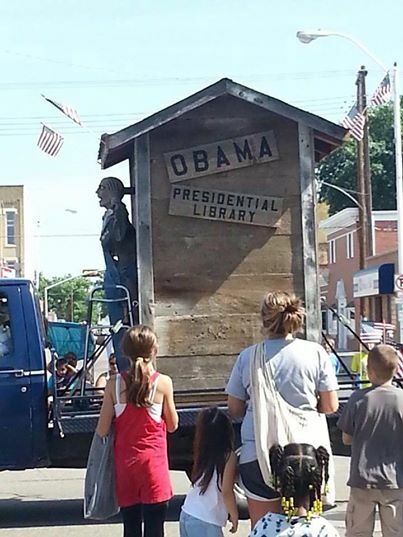 The Obama Float is the perfect example of what Nebraska Nasty is all about.